When is a t-shirt not a t-shirt? Well. I ordered this "t-shirt" from Simply Be last week. 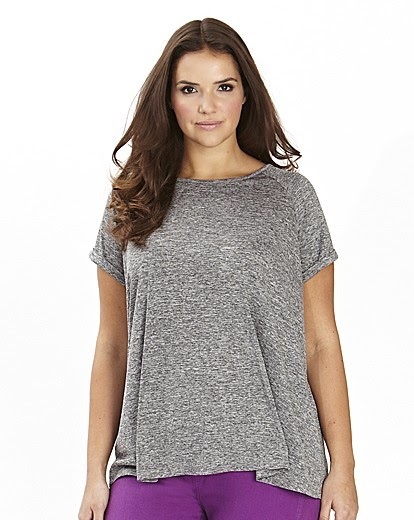 I love simple grey marl T's and I thought the trapeze style of this one was going to make it a little different. When it arrived and I took it out the packaging, the fabric was not what I was expecting. I just thought it would be a jersey, t-shirt kinda deal. But it's not, it's kind of shiny, but you know what? I love it. It feels amazing on and after a wash it dries perfectly, like NO ironing whatsoever and that pretty much makes it the most perfect garment ever in my book because I can literally count the times on one hand that I've used an iron in the last year. I hate it and avoid it at all costs! 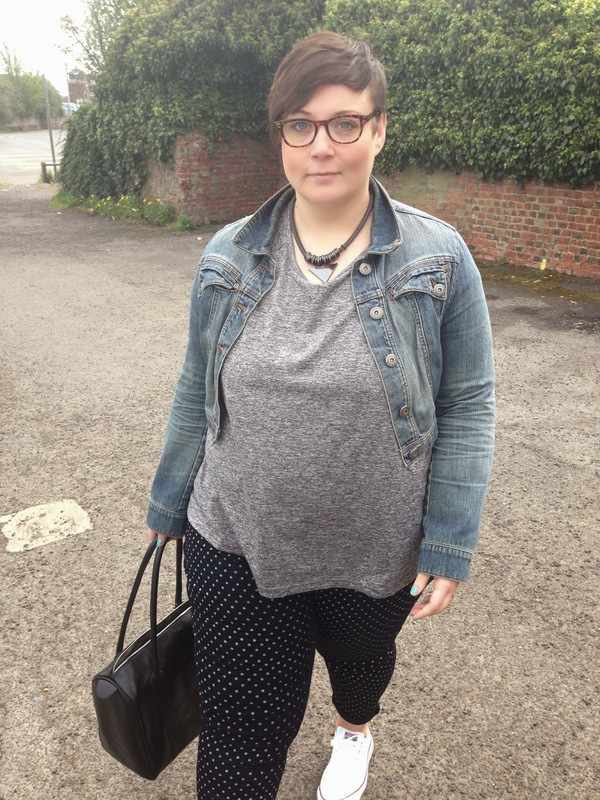 On sunday I was popping into the town centre to run a few errands and inspired by Claire's pic of her outfit that day, I digged around and found my spotty jeggings and teamed them with, said miracle tshirt. Hilarious, the "oh look I'm walking casually" pose. PAH. This is really my perfect outfit. It's laid back, casual and comfortable. The reality of the matter is I'm not some fancy city dweller. I'm a mum, a student, a business owner. Most of the time I'm running around like a blue arsed fly, armed with baby wipes and have biscuit crumbs squished into my thighs, and that's ok! 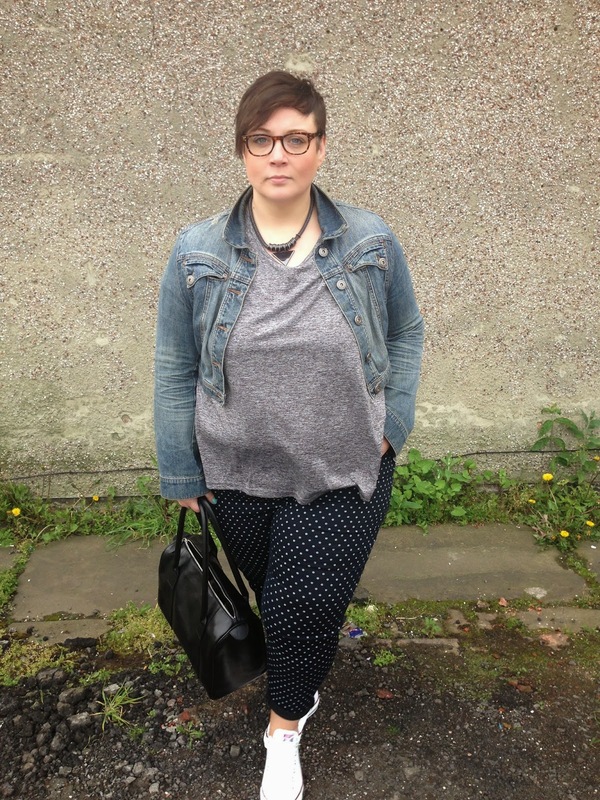 I'm not here to be a 24 hour fashion maven, I'm merely sharing outfit ideas, and feel good fun stuff (well most of the time!) You don't have to be dolled up to the nines to feel great! Chose pieces that make you feel great and dip in and out of trends as you wish! And remember your size doesn't dictate what you can and can't wear. Now go forth and be fabulous! Amen! Love this outfit, looks gorgeous and yes I will never understand how some people are dressed to the nines all the time - they must not have kids and obligations lol. You are superwoman as it is! Wow that looks awesome! Love the combi of shoes, pants and shirt with the jacket... So cool! Oh I love those jeggings! 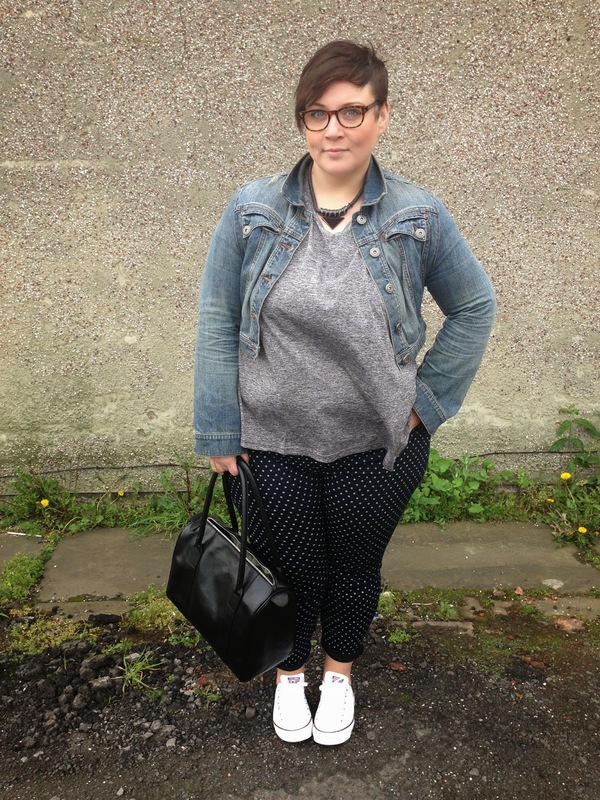 A great casual comfy outfit!